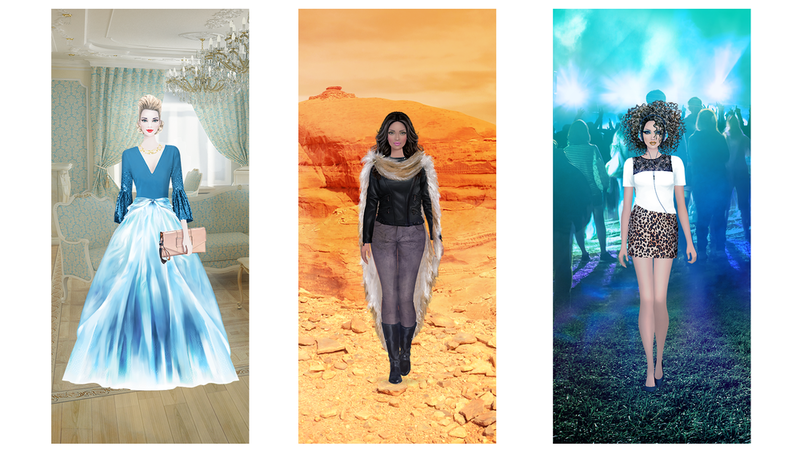 AS WINTER APPROACHES, LET’S TAKE A LOOK at some of the designs from Covet’s biggest seasonal launch to date! If you aren’t familiar with the game, it’s a FTP narrative-driven styling experience for mobile. Last fall, players styled looks for various characters throughout history in a frenetic fashion adventure seen through the eyes of Grace, an ingénue who stumbles upon a time machine. Out of all the ideas I presented to the team, the favorites were the images of an Art Deco elevator and a radiant wormhole. 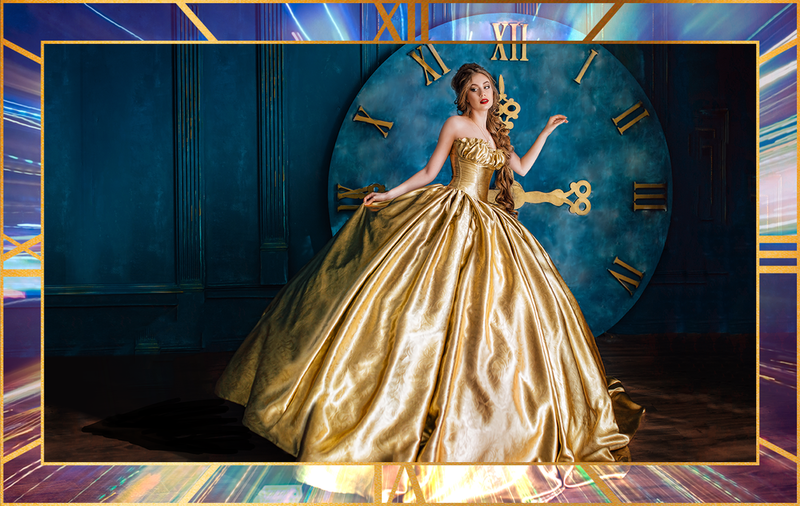 The combination of those images defined the look of the campaign moving forward, evoking both high fashion and the effervescence of time travel. One of the main challenges with this campaign was the wide scope of the story. Typically we’re working within a much narrower scope such as Greek Goddesses or Office Shenanigans. It’s fairly simple to apply a decorative element to events that are closely related. Since this experience was a journey to past present and future, it was crucial to me to brand everything relating to Grace and the overarching story with gold deco motifs and vivid light. That way all of the specific historical and fantasy locations she visited could shine through individually within the Fall Time Travel wrapper as seen below. As the primary event artist, I’m responsible for the visual design of all the main images, including but not limited to the borders, the colors, special effects, and photo retouching. I’m also responsible for the creation of the styling screen backgrounds. In other words, creating a styling environment that matches the main event, whether that is finding the perfect image or compositing several images into one. I want to give credit to everyone involved with this project. Pulling off a campaign like this is truly a team effort. I’m especially thankful for the story and copy crafted by Nikki Chase, the styling and attire by Jessica Perrin and Elaine Ng, and the general direction of Didi Zhai.